The festive season is rapidly approaching, and with it comes the inevitable post-dinner game of Trivial Pursuit with semi-comatose relatives. Capture some of that spirit with our brand new quiz feature! We’ve compiled a set of ten trivia questions to test your knowledge of the Three Stripes’ legendary footwear. Simply click through the multiple choice answers below to get your score at the end. How well did you do? Want to see more of this sort of thing? Fancy a rant about Trivial Pursuit? Leave a comment below or on our social media channels and let us know! And if this has put you in the mood for a new pair of trainers, shop our range of adidas Originals footwear right here. After the success of our last launch night – Spring/Summer 17, we are proud to announce we will be having another to promote and showcase our newest collections from the AW17 seasons drops. With brand new arrivals from the likes of Moncler, Stone Island, CP Company, Canada Goose and adidas to name a few, we are sure to have something for everyone. Our friends from Port of Call will be joining us for a spot of Gin tasting along with some other beverages including Camden Hells and Camden Pale Ale, so why not pop along for a browse, drink and chat with us. Sometimes the clothes used in a film just make us love it even more. After the plot, the clothing makes the film, especially when it is donned by some of the finest in the acting world such as Steve McQueen and Roger Moore. With this in mind, GQ’s latest article runs us through the 38 most stylish films of all time. From Saville Row tailoring in Kingsman: The Secret Service (2014) to Leonardo DiCaprio’s chest baring cocktail shirts in Romeo & Juliet (1996). If you love watching films and have a passion for menswear, check out the article and see which movies you need to add to your ‘to watch’ list. Read the full article on the GQ website right here. The football season has started again in earnest, and with it come swathes of fans representing their side by sporting the team colours. Football kits are important to the game as a whole; they not only have to embody the team and their history, but also the legions of dedicated fans that follow them. So spare a thought for the designers behind these kits: we’re not entirely sure exactly what they were going for with this selection of bright, bizarre and sometimes nauseating strips. Okay, so the team’s nickname is the Tigers, but this extremely literal take is inexcusable. The shade of yellow is bad enough, but the weird Microsoft Paint hieroglyphics on the shoulders take this to another level entirely. The faux tie-dye look and needlessly huge logo make this look like a dodgy knock-off, but someone was (presumably) paid actual money to design this. For when you want your team to look like a delicious platter of parma ham on away days. Another faux tie-dye job, this one’s so bad it’s almost good? Maybe I’m just half-blind by this point. Like the worst fever-dream of a pub carpet designer. Hideous. 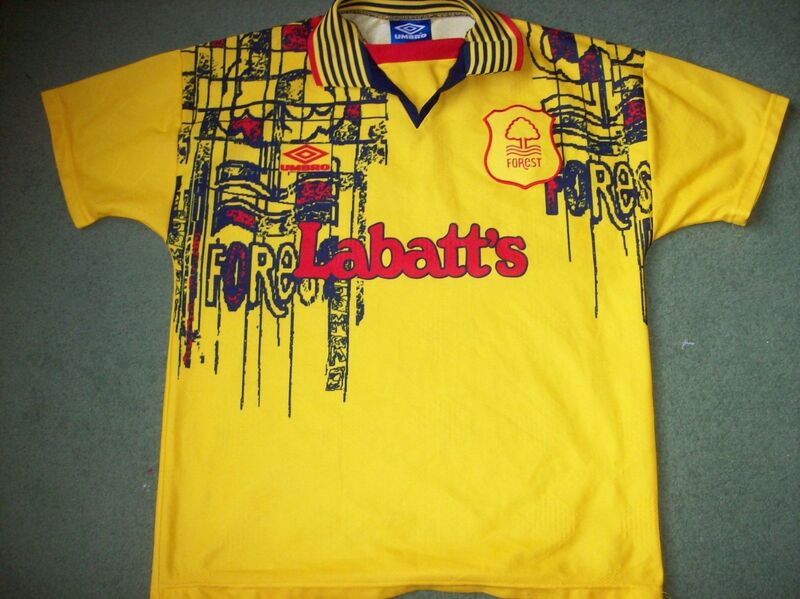 An absolute legend of horrendous strip design, this was mercifully only worn for two matches. Couldn’t leave our home team off the list. Believe it or not, this bizarre design lasted two whole seasons before its demise. Again, a little torn as to whether this one is awful or brilliant. Celtic have one of the most recognisable home strips around, which makes this drab, zig-zag catastrophe all the more inexplicable. 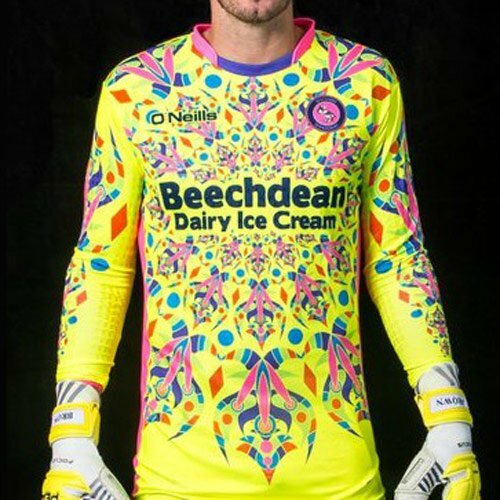 Proving that nauseating design isn’t a concept consigned to the early-to-mid 90s, the League Two side present this magic eye/kaleidoscope monstrosity for the new season, ready to traumatise a new generations of football fans. Have we left any out? Share your own nightmare kits in the comments below or on our social media channels. Last week, we welcomed representatives from one of our favourite shoe brands, Grenson, to our store to talk us through their fantastic new season range, the secrets behind their naming scheme and the origins of their trademark Triple Welt technique (shout out to Kev!). It’s always great to speak to brands that are so knowledgeable and passionate about their products, and we hope we can pass on some of their love for shoes to our customers. Thanks to Grenson for taking the time to talk to us, and for the fantastic after-work company too! With the proliferation of social media and the ability to endlessly scroll through photographs of whatever takes your fancy, it’s sometimes hard to imagine a time when finding information about lifestyle hobbies and interests required either visiting a physical location, or going to a dedicated forum or message board. The sneaker collection scene is perhaps the best example of this; in the 2000s, forums like NikeTalk, Crooked Tongues and 5th Dimension were the go-to place for drop dates, upcoming releases and users flaunting their latest buys, while fostering a sense of community and identity for their members. Complex recently ran an article on how private Facebook Groups like Yeezy Talk Worldwide and The Basement are keeping this spirit alive, offering a closed, community-based alternative to the anything-goes nature of social media, while also providing a peer-moderated space to buy and sell footwear and apparel without navigating the often risky waters of eBay or similar sites. Whether your interests lie in the latest hype trainers or rare vintage terrace classics, the article covers a wide range of groups, and the trials and tribulations of running them. It gives a good insight into an often-mysterious side of internet fashion culture, as well as highlighting the diversity of the different groups and their respective members. The article details renowned stars, James Dean and Steve Mcqueen, with particular attention paid to their shared love of the classic Baracuta Harrington jacket, noting Steve’s ability to bring a masculine finish to his style, whatever the occasion. If you would like to read the full article on “brands that men’s style icons wore,” head over to FASHIONBEANS or take a look at our range of Baracuta G9 jackets. You may have recently seen over on our social channels the hype around the IKEA bag redesigns and customization’s of the original blue bag. Costing the whole of 40p, the blue IKEA bag is instantly recognisable, and on the back of Balenciaga leather bag costing $2,145 (£1,672) a number of Instagramers and bloggers have jumped on the idea to see what they can create from the familiar bright blue IKEA essential. We can safely say there are a few interesting creations in the collection. Over on Hypebeast they have put together a few of their favourites including mock ups of Yeezy 350s, face masks and caps. it seemed like the majority of the DIY community wanted to prove something in response — if Balenciaga can charge thousands on an uninspired copy of a bag that costs less than a dollar then crafty creatives can somehow push themselves to try to make other products that are better and more economically attainable. Check out the full article over at Hypebeast.